Best soundbar deals on Amazon: Discounts on F&D, Philips, JBL and more. The soundbar is one of the simplest ways to boost your TV output. Today, we have found a bunch of soundbar deals on brands like F&D, Phillips, JBL and more. Whether you are looking for a system to boost the output of your TV or a speaker to liven up your house parties, the soundbar is a pretty good opion. Today, We have covered the best soundbar deals that are currently going on Amazon. The products we have listed down below are from notable brands like JBL, F&D, Philips and more. The F&D E200 Plus is a wireless soundbar that features a Bluetooth 4.0 connectivity. The soundbar is equipped with a USB card reader slot, which supports MP3/WMA format. It also has a 3.5mm audio jack to connect the speaker with compatible devices via an AUX cable. Click here to buy. The Philips HTL 1031 2.1 Channel Soundbar connects to the TV or other external devices via an AUX and USB cable. the soundbar comes with a subwoofer, which has an impedance of 4 ohms. Click here to buy. The JBL Cinema SB250 is a 2.1 channel wireless soundbar, which comes with a wireless subwoofer. The soundbar allows you to control the tracks and volume through your TV remote as well. It has a maximum output of 200W and has a frequency range between 45Hz-20KHz. Click here to buy. 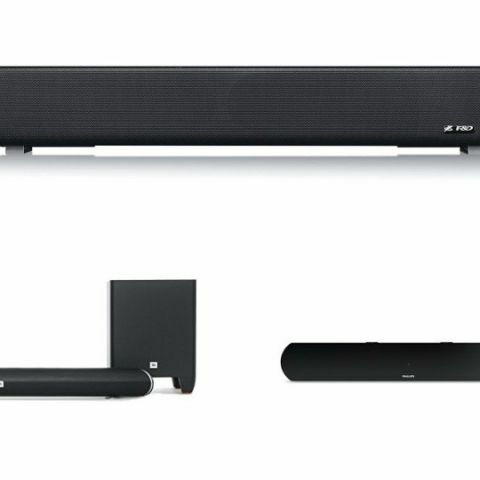 The Sony HT-RT3 Sound Bar is a 5.1 channel surround sound Home theatre system. The speaker features a Bluetooth 4.1 connectivity with NFC one-touch wireless audio streaming. The system is also equipped with a USB slot that lets you connect the speakers to compatible devices. Click here to buy. The Tronica B28s Bluetooth Soundbar lets you stream music via an AUX cable, USB wire, and Bluetooth compatible devices. The device features a 2200mAh battery, which as per the company can provide audio playback of two to three hours. Click here to buy.